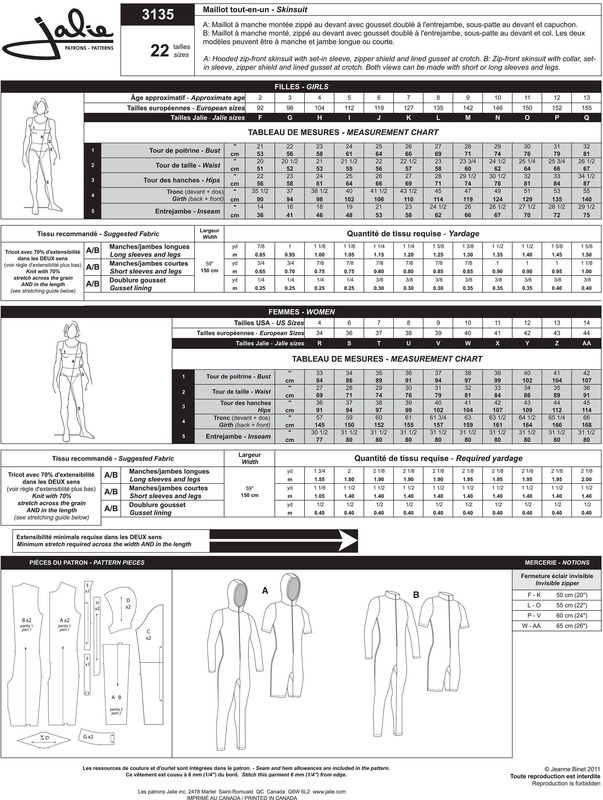 Package includes patterns and instructions to make Skinsuits. View A: Hooded zip-front skinsuit with set-in sleeve, zipper shield and lined gusset at crotch. View B: Zip-front skinsuit with collar, set-in sleeve, zipper shield and lined gusset at crotch. Both views can be made with short or long sleeves and legs. A very versatile sewing pattern! This bodysuit can be anything from a swimsuit to a superhero costume! Great pattern, and it showed up well packaged and in great shape! It's going to be a busy few months for me. Thank you for shipping all my Jalie Patterns fast. I have my work cut out for me.